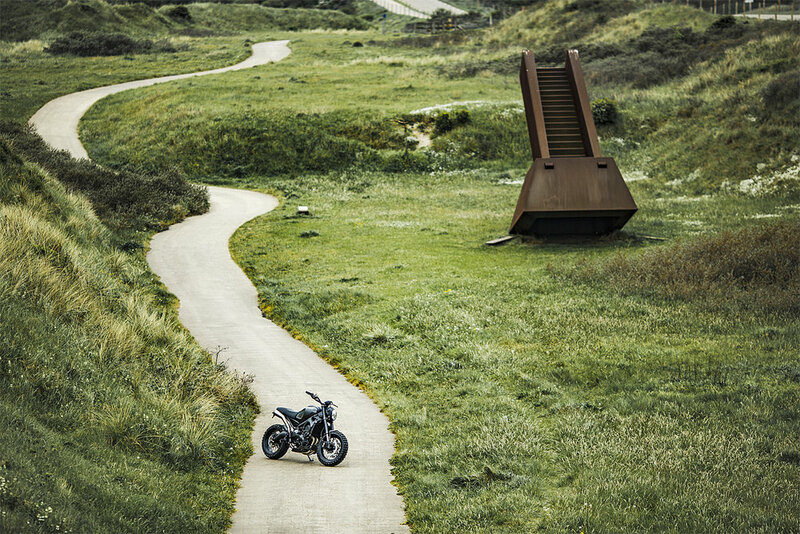 Yamaha continues to embrace the custom bike scene with its latest Yard Built creations on show at Wheels & Waves in Biarritz and its Faster Sons project entertaining crowds across the border in northern Spain. 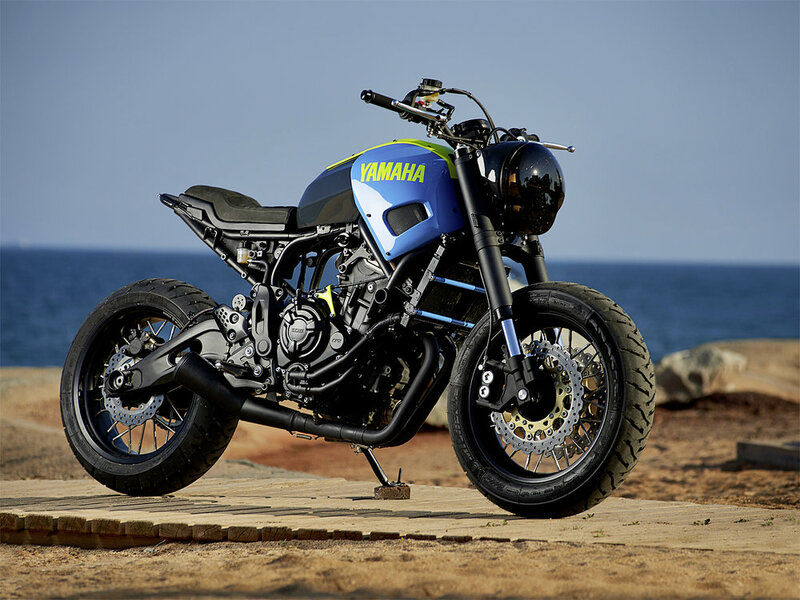 The Faster Sons – performance customs usually based on Yamaha’s latest models such as the XSR700 – weren’t just on display, they were flat track racing. 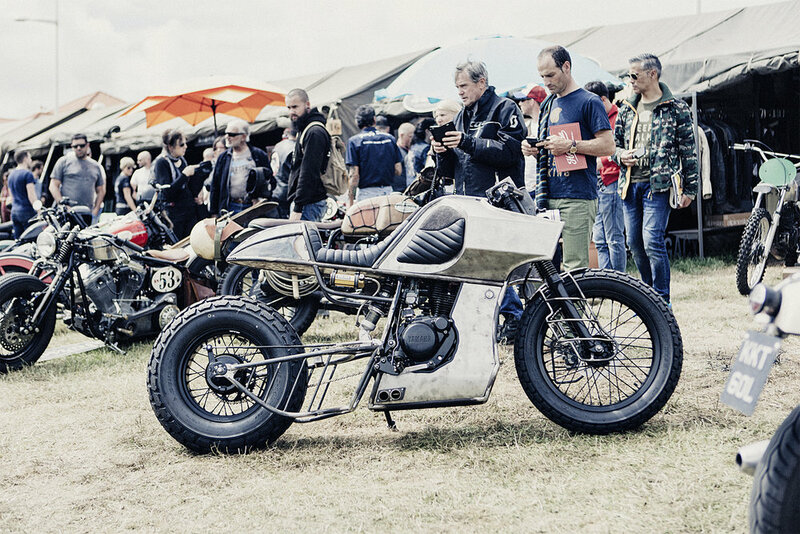 Californian custom builder Roland Sands, Bike Shed UK editor Ross Sharp, Sideburn magazine’s Gary Inman and Go Takamine, the founder of legendary Japanese custom house BratStyle, were among the entrants competing on specially prepared Yamaha SR400s. It was close, but ex-AMA 250cc road race champ Sands eventually came out on top. In the modern bike class, Italian flat track ace Marco Belli stormed to victory riding an XSR700 Yamaha. The Faster Sons flavour continued with the Yard Built bikes featured in the Wheels & Waves Artride exhibition. 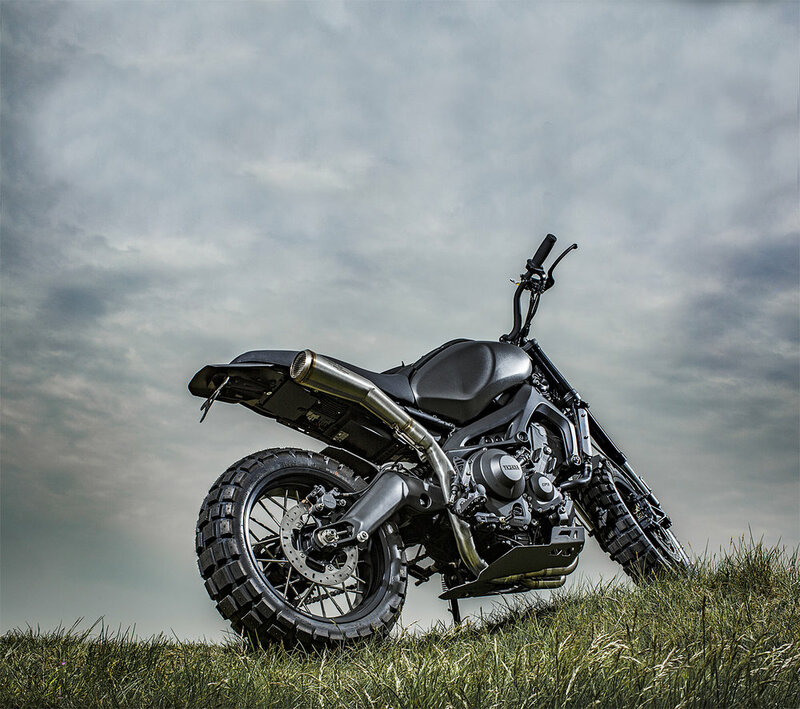 Highlights were Wrenchmonkees’ XSR900 MonkeeBeast, Moto di Ferro’s XV950 Speed Iron and Bunker Motorcycles’ XSR700. Star of the show though was the breath-taking supercharged SR400 from Belgium’s Krugger Motorcycles – see the next issue of Built for the full story. 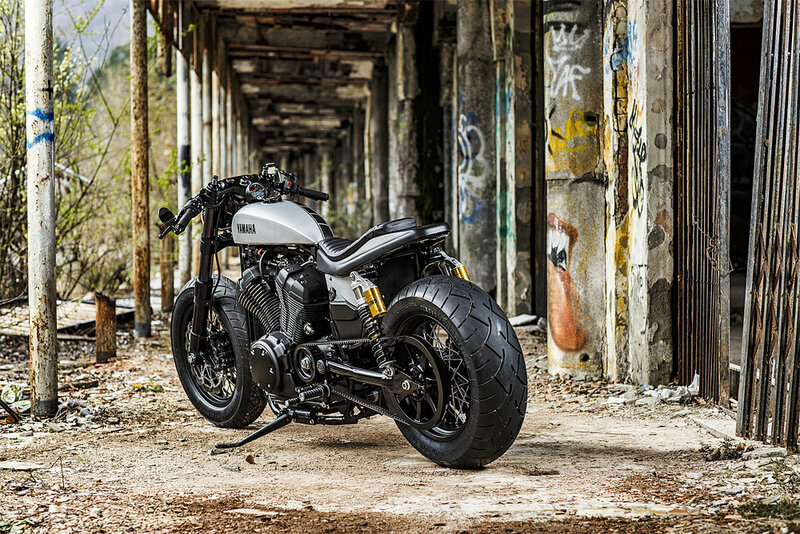 David Gonzalez of Ad Hoc Café Racers, from Barcelona, has delivered a rough and tough take on the XSR700 to create a bold street tracker. Having customised XJ650 and XJ750 classics in the past, David followed Yamaha’s golden Yard Built rule of no cutting or welding to the frame – Yamaha are keen to prove you can customise an XSR without major fabrication work. To get the Ad Hoc look he added a number of genuine Yamaha parts from other models: an MT-09 stem and handlebar set, R6 front forks, disc brakes, brake master cylinder and clutch, and the front light and bracket from an MT-01. The original fuel tank remains, hidden by a custom shell built in four modular parts. The radiator was painted black to blend with the engine block and the air filter box was replaced to open up space. The exhaust is an aggressive-sounding full SC Project system and a rear subframe is custom made to bolt on, allowing access to tools and battery. Ride height gets a lift by 15mm with a Gears Racing shock and a custom seat is added with high quality cowhide. The bike is finished with old school blue and yellow Yamaha Racing colours, giving the bike a modern, light-hearted twist. Brothers, Mert and Can Uzer are not your typical custom bike builders. Can is a top level skateboarder with the Vans Turkey Skateboarding Team, while Mert recently gave up a career in digital advertising to build custom bikes. They run Bunker Customs in Istanbul and grabbed the attention of Yamaha with their distinctive 1982 Yamaha SR500 build, which led to the collaboration with Yard Built and this XSR700. To create their tracker-style Bunker they increased ground clearance from 14cm to 20cm by relocating the exhaust and changing the front wheel to a 19in rim for off-road riding. Stock body panels were ditched for hand-beaten 2mm aluminium items. Renthal bars suit the new riding position and the seat height has gone up by 6cm to match, thanks to a bolt-on extension that can be fitted to any XSR700 stock frame. Also gone are the stock forks, replaced with MT-09 Tracer upside down units. The standard rims are also ditched in favour of Super Ténére spoked wheels on Goldentyre GT201 rubber. The exhaust is handmade in stainless steel and incorporates an Akrapovic cat where the muffler and the 2-1 headers join. Copenhagen-based Wrenchmonkees are no strangers to the Yard Built project having created a range of custom bikes based on the XSR400, XJR1300 and now, this XSR900. Delivered in their trademark black, Monkeebeast is no run-of-the-mill cafe racer or brat style machine but a brawler capable of tackling almost any terrain. It has Borrani 17in spoked wheels with black rims, 9mm stainless spokes and black hubs shod with Continental TKC tyres. The front brakes are upgraded with a Nissin radial front master cylinder and steel braided brake lines. The rear-end gets a K-Tech shock, Gilles chain adjusters and a TRW rear brake disc and steel braided brake lines. Wrenchmonkees used their own one-off seat, Gilles rearsets (modified with enduro footrests), a Magura handlebar and Biltwell Renegade grips. Switchgear is Motogadget. Headlight is an MT-03-style unit, rear light is LED. A growling SC Project exhaust caps a modified MT-09 system. One-off parts include a front and rear fender and engine guard – all in powder coated aluminium. Wrenchmonkees aim to sell a range of parts designed for the Monkeebeast. Speed Iron is the brainchild of Marco Lugato, and Italian builder who established Moto di Ferro in 2009. The collaboration with Yard Built came about after last year’s Wheels & Waves when Marco, Yamaha’s product manager Shun Miyazawa and marketing coordinator Cristian Barelli exchanged ideas. An XV950 was chosen and the project was born. The concept for Speed Iron comes from Marco’s passion for going fast. A handmade aluminium tank and rear seat unit take the weight down and complement the handmade aluminium side panels. Chunky tyres are wrapped around Borrani rimes and while the look was important, Marco didn’t want to sacrifice rideability. Stock forks are replaced with V-Max suspension and the front brake discs are increased to 320mm and benefit from V-Max calipers for increased stopping power. An Acewell odometer provides just the right amount of data for the rider and an Arrow exhaust adds the soundtrack. Other pieces include Tarozzi footpegs and LSL dumbbells. A handmade subframe sets the clear line across the bike and an aftermarket headlight and brake lights integrated into the indicators keep everything clean. Marco plans to make various parts from the Speed Iron build available to customers who wish to can create their own XV950 custom.